Greetings! If you are trying to make it as an independent artist, you should definitely get familiar with Nikkole. She is a prime example of what a person with ambition and vision can accomplish on the music scene. Amazingly, Nikkole has set a new standard of what can be achieved in the world of music as an independent artist. She has been a GRAMMY nominee contender four years in a row in 2007, 2008, 2009, and 2010. Her talents have electrified millions! While Nikkole is adored by many for her contribution to the world of music as an independent artist, she has also been revered by artists involved in the music industry. She has worked with such stars as Babyface, Boyz II Men, Macy Gray, Bobby Brown, Arturo Sandoval, Teena Marie, The Emotions, Ambrosia, Jon B, The Temptations, Lakeside, The Commodores, Midnight Star, Gregory Hines, DJ Quik, Melle Mel, Whoopi Goldberg, CASE, Cedric the Entertainer, Everette Harp, David T. Walker, Patrice Rushen, Blood Sweat and Tears, and Norman Brown. On Norman Brown’s #1 Billboard smash ”Stay With Me” (2007), more specifically the radio-friendly cut ”You Keep Lifting Me Higher”, Nikkole was not only the featured vocalist, but she also co-wrote and arranged the vocals. The project spent 8 weeks at #1 on Billboard’s Contemporary Jazz Charts. The album remained in Billboard’s Top 10 for over 4 months. I met Nikkole around 2004, 2005. This was during the time that Steve Berson and myself formed Warlock Asylum. In many ways, she acted as a mentor during the formative stages of the Kiss of the Immortal album. I was in a dark place back then to say the least, and though Nikkole was becoming an accomplished musician of note during this time, she would always encourage me to keep pursuing my dream despite life’s adversity. Interestingly, our song Sleepless Nights In Havana was inspired , in part from our friendship, along with my connection to my sister Sylvia. From my personal and a professional level, I can say that Nikkole’s heart, her work for humanity, is just as big as the artistic abilities that the gods have blessed her with. It had been some time since I had spoken with the “Genie of Soul.” We fell out of touch for some, but with the help of the vast array of online social networks and Starbucks cafe, we were able to talk during tea time and catch up despite busy schedules. I thought that our readership would find Nikkole’s words very inspirational and insightful. Maybe if you are an up and coming artist, you may want to take notes. Don’t be afraid! Step in the arena and meet the new reigning queen of R n’ B, Ms. Nikkole, and that’s with two “Ks.” Smiles. Messiah-El: Thank you so much Nikkole. It is great to finally have you as a guest for Blue Steel Magazine. From my own personal experience, you have really inspired and helped keep my focus as an artist during a crucial life crisis to say the list. I am sure that you receive a lot of applause and appreciation for the art that you have shared with the world. However, for our readers who may not be familiar with who you are, how would you describe yourself? Nikkole: Firstly, let me start off by saying how much I appreciate your kind words. It truly warms my heart to know that I have helped you as an artist! To describe myself, I would lead off by saying I am a very dedicated and focused individual who is driven, determined and resilient. There are many layers to my personality, and in the music industry as a professional independent artist it is easy to find a place for each layer. Messiah-El: Your life as a musician, singer, and songwriter seems like a marriage made in heaven, based on your work. What inspired you to pursue the musical arts? Nikkole: As a young child I always enjoyed going to concerts and singing in church. I would get such a high from watching performers sing, dance, act – simply captivating an audience with their talents. It was during those times that I knew that I would be a singer and a songwriter. I wanted to move people with my words, voice and music, so I honed my skills and crafted my first song at 6 years old…entitled “Tragedies”. My brother and cousins and I would hold our own concert events for family and friends. We would build sets and sing our original songs in addition to Top 20 hits! Messiah-El: Listening to your music and some of the themes that you cover, I can see that you present a package that is positive, as it is real. Is there an overall message in the work that you do? Nikkole: My ambition is solely to be me, and so my music is a reflection of my life and things that I have experienced. Lyrically, musically I feel songs have to touch the listener and evoke an emotion. To achieve that, I think writing songs in a clever fashion as opposed to a lascivious manner is the best approach. I wouldn’t want to record something that I would be embarrassed to sing in front of my Grandmother. So writing a song poetically instead of graphically is my approach. Messiah-El: There is a growing consensus among people of all walks of life concerning the direction of the music industry. Many people do not agree with the direction that some artists have taken. Do you find it challenging maintaining your ground as an artist and how you present yourself? Nikkole: That is a really good question. I genuinely feel that if you are true to what you believe in and stick to your goals you can achieve anything. In every profession there are changes that happen, the key is learning how to make those changes work for you and your objective. Since I started out as an indie artist, I have seen quite a few changes in the industry, as more independent musicians are able to release their own product to the masses. And now, it’s cool to be an indie artist (it wasn’t so much the case 10 years ago). But, I feel that we still have a long way to go. I would like to see all qualified musicians (major and indie) on an even playing field when it comes radio airplay and promotions…and that is another story!!! Messiah-El: Your music is appreciated by people from all walks of life. It sounds like it is in a genre of its own. What artists have influenced you musically? Nikkole: Thank you very much. Growing up in my house I heard all types of music, which is the best atmosphere to be in for a budding musician. I gravitated towards artists such as; Natalie Cole, Donny Hathaway, Teddy Pendergrass, Teena Marie, Deniece Williams, Mariah Carey, Rod Stewart, Journey, BabyFace and Luther Vandross to name a few. 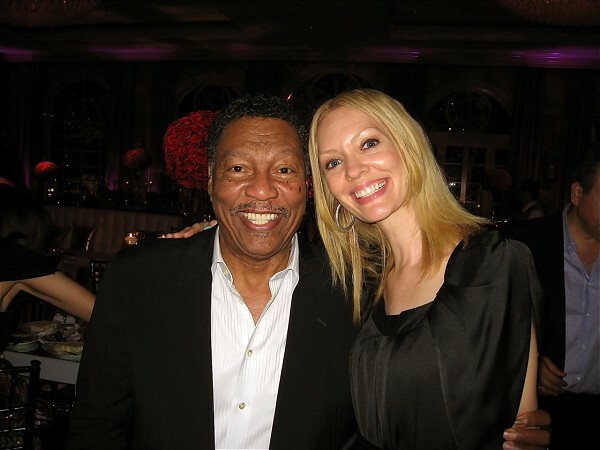 Nikkole with the legendary Billy Davis Jr.
Messiah-El: When I think of Nikkole, I think of a successful “independent” musician, one who has reached heights that some artists who are signed to major labels haven’t. What are some of the reasons for maintaining your status as an independent artist? What are some of the ups and downs of this career choice? Nikkole: My attitude is to keep going strong no matter what life throws my way. I never get caught up in what people think I should do with my career or the (keeping up with the Jones’) syndrome – so to speak. It is important to have your own clear path and stick to it without distraction. I have always wanted a music career and with all of the choices that I have made, they somehow reflect how I feel about my career. In saying that, I believe that I have laid a path of goals for myself; and all I want to do is obtain them. Granted, I do spend a lot of time in my studio, on the road and writing – this does limit the time I have to spend with loved ones, but everyone understands and they are all very supportive. Messiah-El: I know that success in any craft requires hard work. If you don’t mind sharing with us, what is an average day like in Nikkole’s world? Nikkole: I have never been afraid of hard work. In any business in order to be successful one must be up for the challenges! Depending upon my schedule, I wake up (normally early) – eat…MUST HAVE COFFFEE (LOL), workout, then prepare for my hectic day of either traveling to perform, or heading into the studio to craft new material, do radio interviews, take meetings for new projects, endorsements and strategize my next move. I always have to be ahead of the game and be prepared with my next move. Never waiting for it to happen…I have to make it happen! Messiah-El: In your music video Amazing, we see people laughing, having a good time, and experiencing the joys of life and love. Is there any spiritual path that plays an instrumental part in your music? Nikkole: I think faith plays an important role in everyone’s life. I believe that GOD wants us to believe in ourselves and look inside for the strength to push to the top! It is also important how we treat our friends, neighbors, family…respect and kindness is a must. “Better than a thousand hollow words, is one word that brings peace”. Messiah-El: Where do you see Nikkole in the next five years? Nikkole: I see myself reaching a broader, more massive audience. Continuing to write songs for and collaborate with world artists. Messiah-El: I noticed that you have spent some time in collaboration with other artists. You have shared the stage with artists such as, The Temptations, Blood, Sweat, and Tears, and Macy Gray, just to name a few. How do you pick and choose the artists that you would like to work with? Nikkole: As for my collaborations on live performance dates. I was chosen by those artists. On my recording duets with artists that are on my projects such as; Everette Harp, Arturo Sandoval, The Emotions, Melle Mel, and David T. Walker…I always enjoyed their musical contributions and learned so much from their style and work ethic, etc. it was a must that I work with them and soak up their talents! I also worked with Norman Brown on his “Stay With Me” cd. I penned and sang on “You Keep Lifting Me Higher”. Nikkole: I love that…Yes, I am always open to collaborate with wonderful artists like yourself! Messiah-El: I met you a little bit before you released “Gon’ Bounce.” It’s one of my favorites. Out of all the music that you have done, what is your favorite song in your own musical catalogue? Nikkole: Right…I remember that…“Gon’ Bounce” was a huge success for me, it even debuted at #1 on American Idol Radio. It’s always a crowd pleaser; I end my shows on this song. WOW, that’s a great question – Hmmmm, I enjoy all of my songs for so many reasons as each song expresses a part of me or my experiences. But since I must pick one song…today I’m going with “Love Was Made In Heaven”. Messiah-El: Before pursuing a career in music, you spent some time modeling. What was it like transitioning from the world of modeling to the musical arena? Nikkole: It wasn’t a hard transition at all, because while I was modeling I was saving money to release my first CD “Appearances”. During that time I was honing my craft, singing backgrounds for various artists…music has always been in my life and it always will…it is my life! Messiah-El: How has your relationship with Ken Yasuda, a world-class bodybuilder, affected your artistic career? Nikkole: I believe seeing Ken’s work ethic and dedication to becoming number 1 in his field has enhanced my thought process and vigor to be able to get through any situation and make it work to my satisfaction, no matter what! Messiah-El: Now you have been a Grammy contender for quite some time. I know it must feel good for your music to be acknowledged by one of the most prestigious musical awards ceremonies in the world. What is your opinion in all of this? Nikkole: It is indeed an honor to have been recognized by NARAS, it is especially a feat because I am an independent artist on my own independent label. There is a lot of great music out there that is not being backed by a major label…so being able to get to this point shows me that the music business is changing…slowly but surely! Messiah-El: Finally, what advice would you give to those who are interested in becoming a musical artist as a life path? Any final thoughts? Nikkole: Firstly, you have to want it more than anything, have thick skin, and be smart about all of your choices. It is not JUST about the desire to make music; you have to remember this is the business of music too. Planning and order is key in your organization of having your own label. Read and learn as much about the legal aspects of the business, and absorb what your associates may know (and by this I mean the people who are actually making a living from music). Follow your heart and remain true to your own style. Release quality music that is well produced, mixed and mastered with a clear sound quality. This is really a nice interview Nikkole! Very in depth, kuddos to you and all you do. Nikkole…beautiful inside and out. A consummate performer.